It was one of those things. I never had a desire to see “Joseph and the Amazing Technicolor Dreamcoat.” It was a David Cassidy/Donny Osmond vehicle, which prejudiced me toward it being way too bubble gum and cute. In retrospect, after seeing the show, I think I was right about the Broadway productions, but wrong about the show, which is a sweet play by a then-new Broadway tunesmith, Andrew Lloyd Weber. “Joseph” was first presented in 1968, and was only 15 minutes long. Lloyd Weber was 19 at the time, and this piece was commissioned for a young boys’ prep school, Colet School in London. He partnered with Tim Rice. It was well received, and by 1973 it grew into an expanded two-hour musical. Though written before “Jesus Christ Superstar,” it came to public attention afterward. At this time, “Godspell” was also getting attention. Musicals, such as this, that are meant to connect on a spiritual level are best to “keep that in mind” and not go for glitz and become too grandiose. So, “Go Tell It on the Mountain!” Because that is what Music Mountain did and they connected with the audience in all the right ways. Though there are two lead characters, “Joseph,” by its nature, is meant to be an ensemble show. But I do want to give a shout out to the two leads, Jill Palena as Narrator and Patrick Mertz as Joseph. The narrator can be played by a man or woman, but with a woman in this pivotal role, it gives more musical balance to a story of a family with 12 sons. From the first notes of the evening sung by Palena, you know you are in for a treat. As per the program, she has done this role before and, in balloon pants and high heeled shoes, she comfortably owns all she does. She excels. There is a cast of 56! All raising a joyful voice! Kudos to director Louis Palena for his masterful use of the stage with such a large cast and for the great choreography. 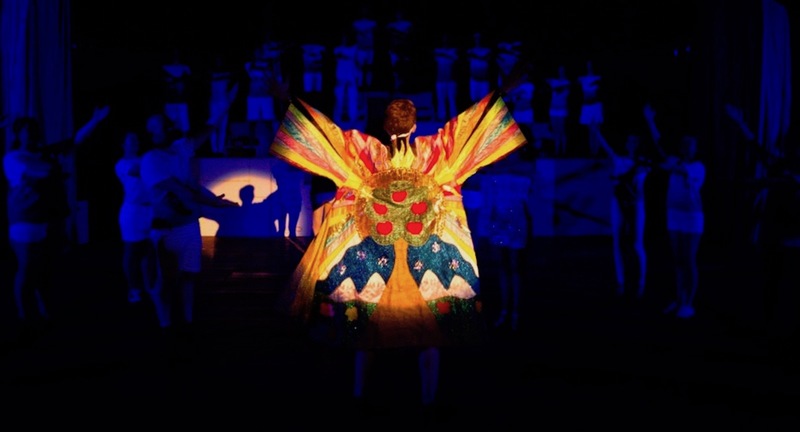 Costumes, as well, by Jordan Brennan, Travis Gawason and Amy Bishop were wonderful. 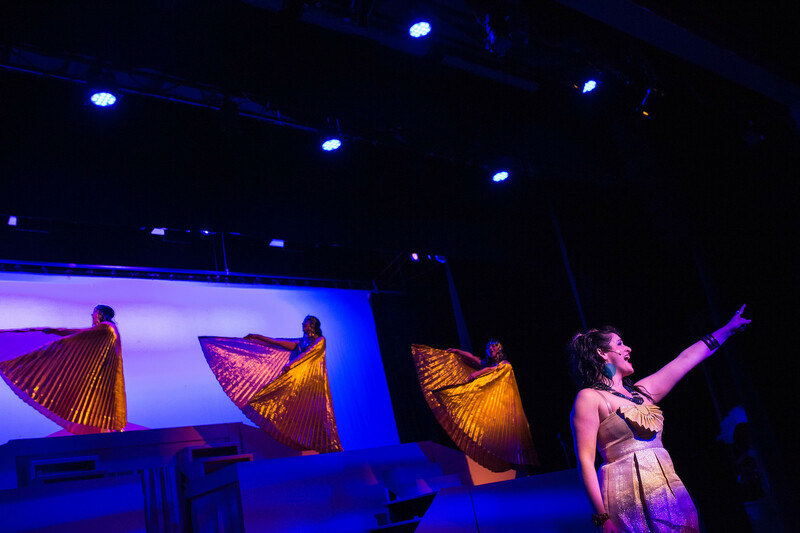 The golden-winged Soul Sisters in the second act were especially outstanding and elegant. As mentioned before, this is an ensemble, and there were multiple moments for individuals to shine. To name a few, there is Eddie Honan who chameleon-like plays three roles as Jacob (Joseph’s father), Potiphar (Captain of the Palace Guard) and the Baker. Always dependably funny, he is wonderful in the song “Potiphar.” Mark Whitman, as the brother Reuben, proves to be a triple threat as actor, dancer and singer as he leads his brothers in singing the country western tribute song, “One More Angel in Heaven.” Karl Wiegand shakes, rattles and rolls as an Elvis-like Pharaoh during “Song of the King.” And you just have to love, again as always, Tim Chastain who plays Judah, as he sings and dances “Benjamin’s Calypso.” And a shout out, as well, to brother Benjamin, Travis Gawason, who is also quite the dancer. 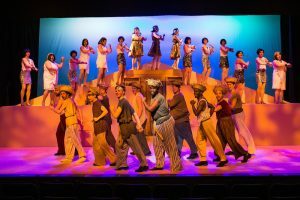 At the beginning of the show, young people are being told the story of Joseph, and during the song of “Jacob’s Coat” and throughout the show, they participate. For example, when singing about the coat, they each have a different colored flag to wave when a particular color is mentioned. At the end of the show, the junior cast members are delightful in recounting the highlights. They are brought in and cheerlead by their counterparts, Jill and Patrick and all the brothers and Eddie and Jaime Geddes and Sharon Rudda and all those of the regular Music Mountain troupe. In the glitz of many a professional production, the sense of community gets lost. A coat of many colors just seems like a special coat. But here, it is as it was meant to be and as it should be. It is a coat of arms for a community. The coat of red, yellow, green, brown, scarlet, black, ocher, and peach are the tall and the short, the young and the old, the heavy set and the skinny, the gay and the straight, the black and brown and white that are in our community and whom we love. The fabric of community and family are unique threads and nothing comes across clearer in this production, which is amazingly technicolor itself. The show continues through April 21, and tickets can be ordered online.